A few weeks ago, I posted photos of some items I found while cleaning a random space near the computer. One of my guild members quickly pounced on the key chain and the scissors. "What do you want for them?" Nothing. "No. Really. How much do you want?" Um...nothing. Zero. Zip. I'm just glad to get them out of the house. If you want, you can reimburse me for the postage to mail them. (That came to a whole $1.90.) "Are you sure you don't want anything for them?" Positive. But, she decided that just wouldn't do and set out to send me the cariest of all care packages. It arrived on Thursday of last week. Now, this is the gal who sent me the amazingly awesome hippo toy that sings "I want a hippopotamus for Christmas". (Click on the link if you missed the post the first time.) I really, honestly, didn't need her to do anything for me in response to sending those two items. I'm glad they provided her with happiness and have a good home. But she insisted. So she also had to wrap the box to make sure it would take me a long time to get into it, as it only took me a few minutes to get into the hippo box and she had teased me that she'd really wrapped it up. 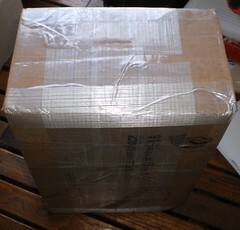 This box was covered with package tape and clear wrapping tape. I got out the utility knife and slit part of one side. Then I shoved in the scissors and cut that side open, repeating with the other side. 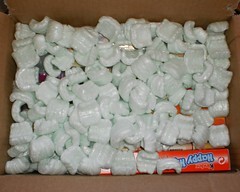 From there, it was a quick slice and cut and, I would say, in 5 minutes, I had the box open to reveal, packing peanuts. Oh wait. There's stuff in here, in fact, there's a whole lotta stuff in here. It must be noted that the girls gave the box a sniff and then wandered away. I can't remember bringing a box into the house that they haven't examined thoroughly before opening. They were absolutely not interested in this one. Look at all the goodies. It was like emptying an unending box of stuff. Chocolate creme-filled biscuits; instant hot cocoa; mini somethings (I haven't opened those yet. 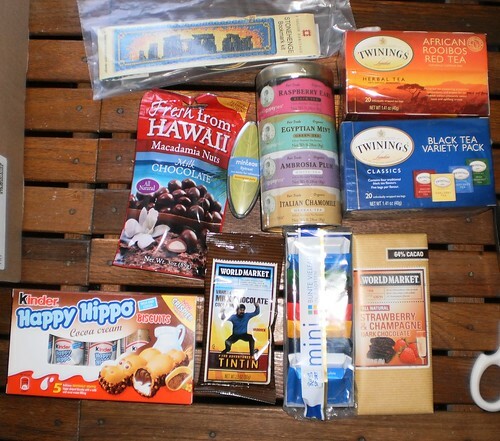 ); a strawberry champagne chocolate bar; chocolate-covered macadamia nuts; breath mints; three different selections of tea and a cross-stitch bookmark kit. WOW. I am amazed and humbled by all this. It's far more than a pair of scissors and a key chain. As this is the year of gratitude, I kind of feel words are inadequate to express my gratitude for these gifts. And don't forget, she gave me a hippo, too. I'm quite touched and very appreciative. I have eaten the hippo biscuits. They provoked laughter, to be sure. We have this theme going. What can I do on my end to perpetuate it? They were good. I also opened the macadamia nuts. As the package is exactly like the packages for cat treats, when I opened it, I had two very interested felines looking at me. Pilchard was downright annoyed that this was people food and not for her. Mija seemed confused. It sounds like cat treats but it's not. I wound up giving them a few treats while I ate mine. Thank you. What a delight to find on the doorstep. I took the blue box of tea to work as I have nearly finished the teas my brother gave me for Christmas last year. I now have plenty to snack on as I play the game in the evenings. The bookmark is going to be stitched some time this year. I've never done a bookmark so I'm interested to see how this will work.